On Wednesday night's "Anderson Cooper 360," CNN analyst Jeffrey Toobin claimed that the federal judge in the Arizona immigration case doesn't possess "a strong political profile one way or another," which is a sign the decision is well-supported by the law. Cooper asked Toobin if Judge Bolton, who decided the case, was a liberal, noting that she was appointed to the post by President Clinton. "She's a Clinton appointee, but she was recommended by Jon Kyl," Toobin responded, "who is a very conservative senator from Arizona." "She's clearly not a strong partisan, but we are a long way from the last word on the constitutionality of this law," Toobin added. "This is a hard case. You are going to see other judges come out other ways on this." 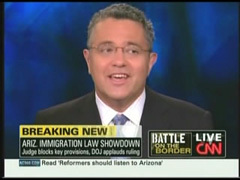 Toobin's points were also echoed by liberal blogs such as Media Matters and ThinkProgress, a liberal blog. Media Matters touted the fact that "Right wing rushes to malign AZ Judge – who Kyl called 'highly competant, very well respected'". The group reported that Bolton is a registered independent, of whom praises were sung by Gov. Jan Brewer, and Sen. Jon Kyl (R-Ariz.). Sen. Kyl recommended her to President Clinton in 2000. After posting examples of conservative sites such as RedState and National Review criticizing the judge and her decision, MediaMatters then posted recent comments made on Fox News by Gov. Brewer and Sen. Kyl, praising Judge Bolton. ThinkProgress also reported what Sen. Kyl said in 2000 of Bolton, when he recommended her to President Clinton. ANDERSON COOPER: It's interesting, because you hear liberals arguing that this is more in line with the Constitution, that supporting the federal powers in this case is more in line with the Constitution – which is basically an argument that many of the people who support this law, you know, also use the Constitution. JEFFREY TOOBIN, CNN senior analyst: Right. Well, there is the text of the Constitution. Article 6 is the supremacy clause. It says federal law is the supreme law of the land. When there's conflict between state and federal, federal law is the supreme law of the land. I don't think she has a strong political profile one way or another. Which is, I think, a sign that this decision has a good deal of support in the law. She's clearly not a strong partisan, but we are long way from the last word on the constitutionality of this law.